Food Safe Mold Making Tutorials by Smooth-On, Inc.
Smooth-Sil® 940, Smooth-Sil® 950, Smooth-Sil® 960, some Sorta Clear® Silicones, and the Equinox® Series are suitable for making baking molds and trays, ice trays, casting butter, chocolate and other applications used to produce foods. The ingredients in these products comply with FDA certification 21 CFR 177.2600. Our TASK® 11 resin can also be used for dry food contact applications. 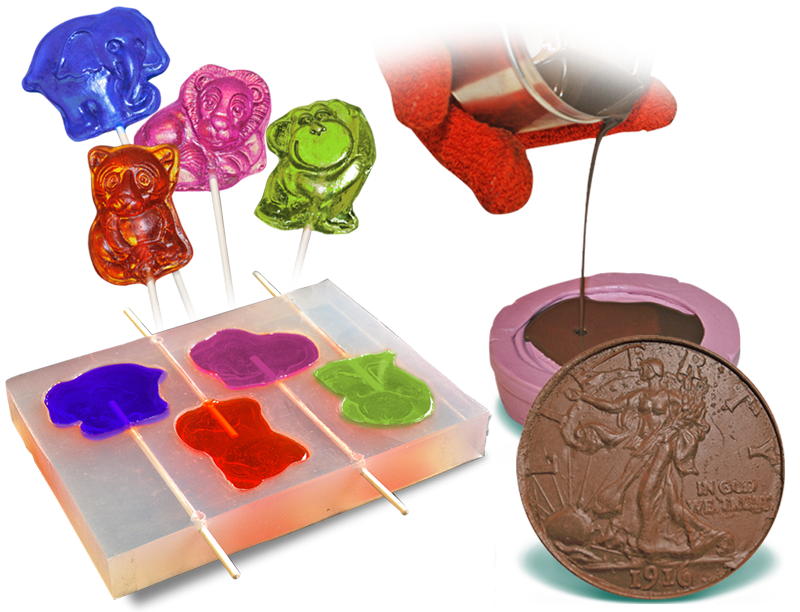 The possibilities are nearly endless; from candy casting, to high-detail cake making applications. Ice sculptures, butter sculptures, even molds for baking breads and cakes can be made from these materials! In this video, we show how food-safe Sorta-Clear™ 37 silicone is used to make a mold for pouring candies. Smooth-On fan Leo V. demonstrates how he made a food safe mold for chocolate using Equinox silicone putty.